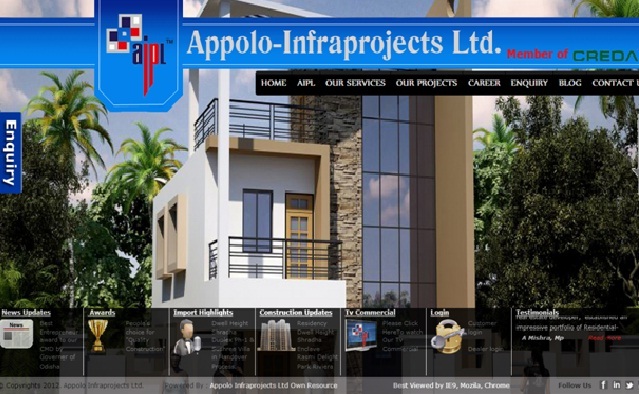 Appolo Infraprojects Ltd is a certified real estate and construction company situated at the temple city Bhubaneswar, Odisha. This company is ready to provide residential plots, flats, villas, simplex, duplex, corporate complexes, shopping malls and mega residential housing projects. In the year 1992, this company was started by three experienced Civil Engineers. This company active in the field of Education, Health sector, Construction, and Social work. This company is committed to provide 100% litigation free lands strictly follow the proper procedures such as Identification, Planning, Designing, and Marketing. This leading company also provides easy housing loans facilities through reputed banks like SBI, HDFC, ICICI, BOI, and IDBI.